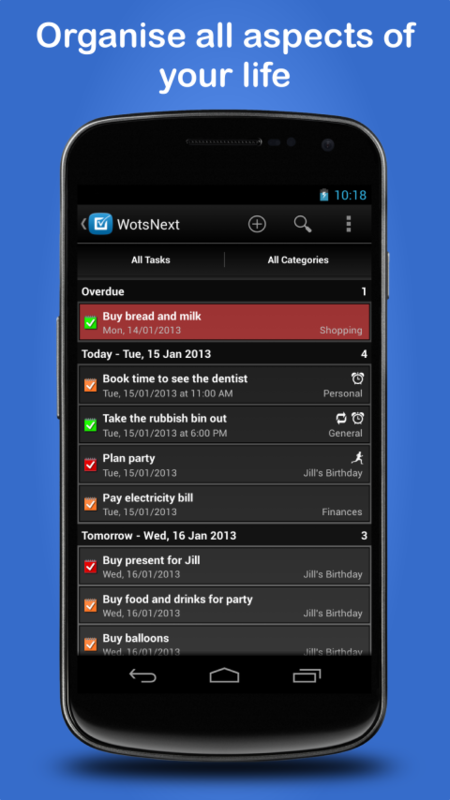 There is a free version of WotsNext and a paid version known as WotsNext Plus. 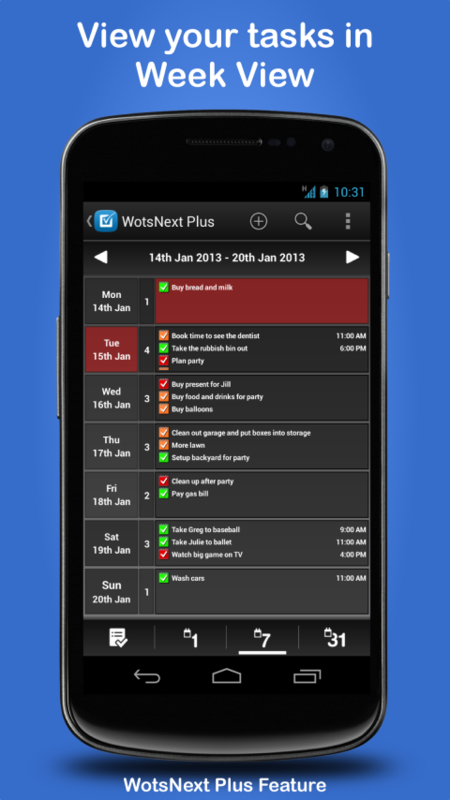 Users can upgrade to WotsNext Plus by purchasing the WotsNext Plus Key available through the Android Market. This license key unlocks the Plus features in WotsNext. 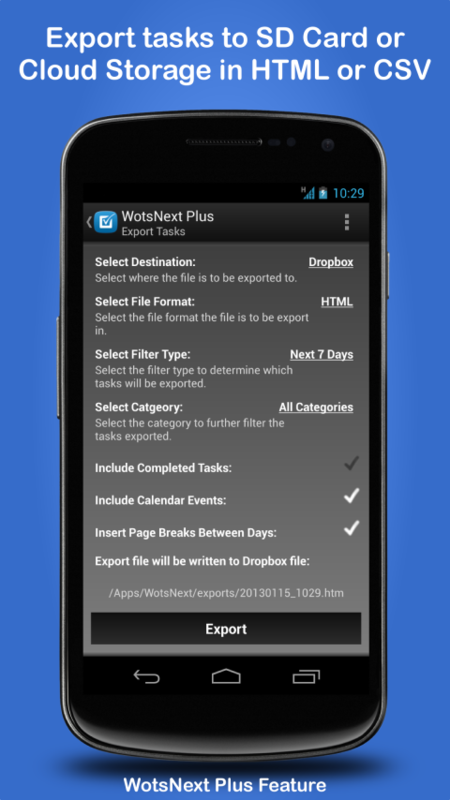 Access your Cloud storage to export files, sync devices and backup your data to. Currently Dropbox and Box are supported with Google Drive coming soon. This one is easy to use yet powerful, and it will get even better with time. I have tried many GTD apps but this one is inviting to use. Great app. Easy to use, helpful colour coding, flexible. I've got categories for each of my 3 kids too - saved me from sinking into household chaos! I've been using WotsNext for the past week and it has been great. I have around 8 to 10 tasks a day and it helps me keep on top of them. 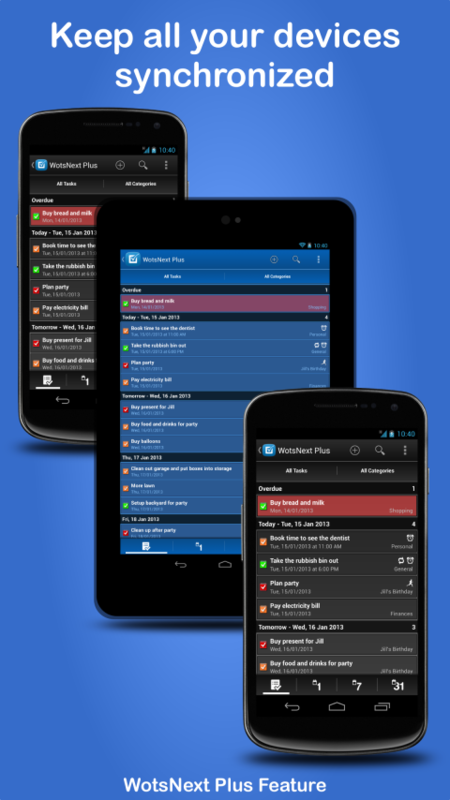 It is easy to use and the daily notifications and task alarms work well. I love the look of it and it been very stable. I would like to see a widget but it looks like it is coming soon from what the developer has written. Also its the first release so I expected more features as it matures. I'm going to keep using it!